Judy Rodman - All Things Vocal Blog: This Is Why Your Voice is Trashed. Really. 10 things to Stop! This Is Why Your Voice is Trashed. Really. 10 things to Stop! 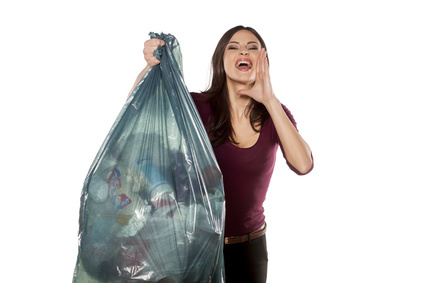 The words 'trash' and 'voice' don't belong together! ...the first step to Change is Awareness. ...all vocal strain and damage, barring actual organic illness, is preventable. So, if your voice has been getting tired, trashed or God forbid, damaged - it's time to get serious and find out why. Check yourself with the following list. Consider every checkmark a big reveal. I did this once. Lost my voice for 3 weeks! But it was a national spot for some beer company and it paid thousands, and there was to be no rescheduling of the session. If that's the case, go for it. But if you think you'll need to speak or sing anytime in the foreseeable future, if you have laryngitis - zip it. Are you going to have to sing in the vocal cord-dehydrating air of Arizona? Better bring some water and pineapple juice. Will you be performing outside in the cold? Bring an artsy scarf and WEAR IT. Are they calling for rain? Actually that can be great for vocal cords if not too cold and you don't get electrocuted holding a live mic. Will you be up in the sun or under lights when it's 100 degrees in the shade? Wear some literally cool stage clothes and drink water like it's free. OK so if you need a cup of coffee to string sentences together like I do in the mornings, go for it. But only one cup, and drink an extra glass of water. DON'T go for it - even in the morning - if you know it brings on the phlegm frogs and you're doing the Today Show. If you NEED to have an alcoholic drink, then consider rehab. If you just WANT one, wait til after your show, and have an extra glass of water to chase it. So you are really into that game, and somebody scores that you love or despise. Better make a pact with yourself to forgo every impulse of blood-curdling shriek. Twenty minutes of screaming can cause blood blisters on your vocal cords. In fact one special scream can cause vocal cord hemorrhage. If you are a metal screamer, learn to do it backwards. Yes, you can. Those I've taught are SO much happier. 5. Sing songs that are too high for you. How do you know when a song is too high for you? It hurts. It hurts your throat and your listener's ears. This is so nuts... completely counterproductive. Take that song up at vocal lessons and either change your technique for those high notes, change the key, or change songs! Pushing too much breath is almost 100% universally an issue with my new students... at first. Because we get to that issue immediately. There is a seriously voice-trashing (eventually damaging) belief out there that to sing powerfully you need to push a lot of breath. Actually the opposite is true... for a powerful sound, PULL breath, like pulling punches, into the most efficient power source possible. Pull laryngeal vibration through an open throat channel and RESONATE for that big sound. There's an equally counterproductive belief out there that you should just relax and sing. The problem with that is that singing requires movement of air, so something is going to have to give. Controlling your breath doesn't mean holding your breath. But delegate that power support to your pelvic floor or lower, not from the middle of your chest (the diaphragm), so you can confidently support your voice without blowing it. Slumping doesn't just look bored or lacking confidence. That upper curve in your back can allow your ribcage to drop, giving your diaphragm too much slack, which blows the lid on your vocal control. You can't take in a good breath, either. Hanging your head forward results in a compromised throat channel. Stand or sit flexibly tall, head over tailbone, and sometimes a lot of issues just fix themselves. One of the main ways you can trash your voice is to talk wrong. You should use the same good vocal techniques for talking that you do when singing. If someone can't hear you, either move in to their ear or use sign language. Breathy talking feels like the Sahara desert wind across the edges of your cords. Monotone comes from a tight, frozen throat channel, and wears your voice out as well as the poor ear listening to it. 10. Neglect your vocal warm up before performance. You might get by with it. Especially if you're singing a lot, with good technique. But for you as vocal athlete, why risk using cold muscles and tissues to fully activate themselves for the main event when it would be so easy to protect them by spending a little time warming them up? The caveat: If you don't know how to do vocal exercises, don't do them. Done wrong, they can hurt you. Just sing lightly, gradually getting louder, to warm up. And do it again if you have multiple sets. Then cool your voice down with light singing or exercises as you go home. Here is a video vocal lesson via Zoom I did with a great singer named Silvana del Campo. Her issue was vocal fatigue... in other words, a trashed voice! Enjoy... and leave comments/reviews! I don't sing, but I do have speaking engagement, something I want to do more of in 2017. Thank you for these tips. One issue I have is rambling. I've found that keeping notes - even for YouTube videos - keeps me on track. And practicing all the time (I practice my presentations when I'm driving) helps me be comfortable when I'm standing on the podium. Kimberly thanks for your comment... yes, I have to keep notes to keep from rambling down rabbit trails, too! Knowing the material we want to deliver like the back of our hand also helps. Btw, love your website 'Keep the Tail Wagging'! My best in your quest to keep dogs (like I want to keep voices) healthy! You forgot also about pushing your voice too low. Emily... you are absolutely right. Pushing your voice low results in hooty tone and vocal strain. Instead, you keep your head back, stay tall and pull those low notes out for richly resonant and controlled tone. I can proudly say i am singing freak.. but the problem is that when i reach high pitches, my vocal doesnt cooperate, i agree with al lthe above factors, let me try again. This is a truly wonderful and informative site, Judy, thanks so much! Jorge... yes, keep trying, but not the same way:) Thank you John! So happy you are enjoying these posts!